Happy Monday everyone! Today I’m sharing a laid back and casual look I wore over the weekend. Off topic, but my due date is quickly approaching (nearly a month away) and Drew and I still haven’t decided on a name yet! We’re stumped! If any of you have any name suggestions, let me know, I would love some more names to add the our very short list we started. Thanks so much for stopping by! I NEED that hat! You always have the best finds! How do you make something so casual look so stylish?! Lovely outfit! Love the casual feeling! I love the name Harper Parcell. What a gorgeous pink fedora, loving all the pastel accessories in this look! I love this casual look! It is perfect! I have been wearing that exact same Lack of Color hat recently and I am seriously in-love! It’s my absolute favourite. And the colour is just fabulous! How cute is your hat! So so excited for you and Drew!! Love the pink accessories to update this jeans and tee look! love that bag with those shoes! looks amazing! This look is SO darling! Simple and casual. Love the pop of pink! Good luck picking a name! There are so many cute options out there! I really need to start saving up for these Valentino flats,they’re beyond gorgeous. Really like how you paired them with the laidback jeans and that pretty hat. Heya Rach! Firstly, I adore your blog!!! I love your fashion choices, you pair things I never thought of and look incredible and I love seeing snippets of your home. Gorgeous decor! Secondly, I thought I’d share some baby girls names I love with you since you’re looking for a little inspiration. Eden, Freya, Emilia and Arabella. Beautiful hat! You look so casual and effortless. Love this look! I hope you guys find a name soon! Love this casual look Rach! The pink hat and the shoes are my favorite pieces. I’m in LOVE with Valentino Rock Stud shoes. They really elevate any look. Thanks for sharing your lovely style! Hope you have a fabulous day! Okay since I have 3 boys, I have to share with you all of my girl names that have been my favorites over the years!! Saylor, Teagan, Eden, Sadie, and Adley were my top choices. So excited for you!! Lovely and fresh looking Rach. Love the Valentino’s! back to basics! love the pink details! Love this cute and comfy casual look. Especially loving that timeless Saint Laurent bag! Choosing the baby’s name is such a special moment: enjoy! I like Erin and Eleanor. Loving this easy and casual look! Looking great Rach! How about Paige? Paige Parcell has a cute ring to it. I’m sure you will find the perfect name. Sometimes it takes meeting your baby to really decide. Best wishes! I love the sound of that. I had a teacher named Paige when I took a class at FIT and she was the sweetest person. Paige is the first name I thought of for you as well! I went to school with a girl named Paige Parks, and I always loved that name. :) Paige Parcell – Pink Peonies :) Kind of fun that it would be the same letters. Other names I like are Violet, Clara and Audrey. What a fun, casual look! I love the pops of soft pink! in love with this outfit Rachel! So simple, but the touches of pink complement it perfectly! Super cute weekend look! I love the blush colored hat and shoes they are perfect for spring! Love the color coordination between the hat and shoes. Great weekend casual look. As for names, maybe one will just come to you when she’s born. I’m sure you guys will think of something perfect. Penelope is a very cute name for a little girl! One of my favorite weekend outfits – a tee and jeans! You can’t beat it. Swap it for a crisp white shirt and some statement jewelry and heels for evening! Congrats on the approaching due date – I am a big fan of traditional girl names ending in y – Milly, Kelly, Cassy. Latest post: Oui Oui for Black and White Prisoner Stripes! I love my name ( Rafaella), and Pia Zarra is sweet. Olivia and Lillie are two of my favorite names. Great look! I love those flats! Cute names! I love Lyla. Even Rose for a middle name would be pretty, as it’s the French word for pink! I love it!!! Isla Rose Parcell is a perfect name! I just love this outfit! You are gonna make your girl so proud when she grows up, having such a stylish mom. As for the names, well Lauren is that typical American name which means ‘glory’ (yes, I’m very proud of my name as a Belgian person :p). I also like Lexi or Lexa. I think Gemma Blair Parcell is really really pretty. I also like Valentina Drew, Genevieve (vieve and Evie are cute nicknames) and Juliette, Vivienne Grey and Everly Alice. Love the pink! Great hat on you too! Such a beautiful casual outfit! love all your accessories! those flats are adorable! Love the outfit! Seriously! Adorable! Name wise – I LOVE the name Majorie its french and the J is silent (Kind of pronouced like ma-shor-ree) and you could call her May for short if you wanted!…I also suggest Findley Rowen, and of course I have to suggest Raye Jean. Its country but I love that name. What a pretty springtime look! Love your hat and Valentinos! Elena should be the first name for your girl. It is both strong and feminine, beautiful. Elena Drew Parcell. That’s the name for your beautiful one. I am sure. As I am Elena. So cute loving that hat!! I love your casual looks! The distressed denim with pointed-toe flats is a perfect combo. The blush hat is adorable, too! Such a beautiful, simple outfit! Love all of it. Some of my favorite names are Claire, Serena, Emma, Isabelle, and Vanessa. Such a fun time for you and your family, enjoy! Love the white with accents of blush pink! Can’t believe your due date is coming up!! This is such a cute casual look! Beautiful outfit, love the ripped jeans and your purse! So cute! 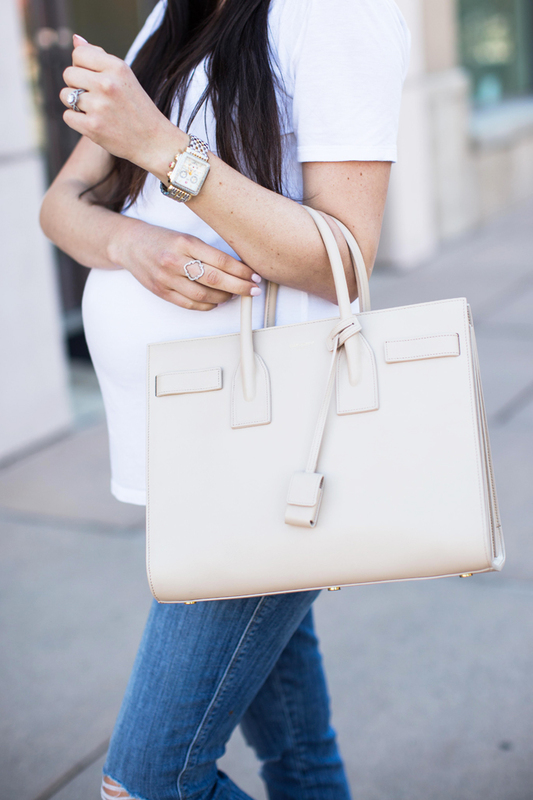 You’ve stayed so stylish throughout your whole pregnancy. So cute and simple!! Love it! Yikes! I’d be in panic mode too if I were you! Hopefully this next month something comes to you, and you find the perfect name for your blessing of a daughter. Regardless of her name, we all know she’ll at least be super fashionable! What a cute casual outfit! My favorite baby girl name is Emma Grace but Emma is wayyy too popular right now. I also really like Charlotte! Loving this casual outfit! The tee fits you perfectly! Love the pastel hat! I’m also a fan of your watch. Picking out baby names can be pretty taxing. I haven’t even been pregnant yet and my special someone and I can’t seem to totally decide either! I think Emmy would be nice or maybe Riley or Vail. That hat is so chic, you look so lovely as a mom-to-be! I completely agree with the name Eiley! Something about it seems to perfectly fit for your daughter, but if you and your husband wanted to add an unique twist you could spell it I-S-L-E-Y(Isley), and still pronounce it the same way. Congratulations and God bless you guys on your newest and littlest addition!!!! You’ll must be the most beautiful mother! I think I’ll love the name ,Belle. NOT because of the same with my name!!! Even the name is easy,but it is really beautiful! Just came across your blog and this is my first time commenting! You are an adorable pregnant momma. My hubby and I I have 4 young boys and just had our first girl. We named her Jane. It’s been my favorite for a long time. I also love Claire, Vivian, Olivia, Genevieve, Giselle, Ruby, Harper is cute. Good luck! My twins are Charlotte Ryan and Logan Jack. I can only imagine how hard it is to decide on a name! Whatever you decide I’m sure will be the perfect fit – PS I’m loving your pink hat! We have an Ava Lily, Ruby Genevieve and a Lola Mae. Good luck! You look beautiful, Rach. I adore following your blog and IG account. We named our daughter Elle, it means “she” in French… I love how sophisticated it is. Elle Parcell would sound adorable! Love it. That pink hat is so perfect for the Spring! I just LOVE that hat! The color is gorgeous! So cute! How do you still look better in jeans than me? Lol! My girlfriend just named her daughter Novella, which means a short novel… I think it’s a lovely name. looking classic in this simple white tee and jeans look! it’s so close! good luck with the names!! I had a daughter in October and named her Annabelle. Classic and not too popular (yet)! you are one fashionable MAMA! I’m 20 weeks pregnant myself and am having a boy but did have some names picked for a girl in case it was a girl. Here are some suggestions: Maya, Ryan(yes for a girl), Charlie, Alexandra, Alice, Paige. I’m having a hard time with boy names, so I totally understand. Love it! Bought that hat and one more! I have a friend who just named her baby Olive. She is prettiest little baby and I just live that name! Not Olivia but Olive. Good luck!! -Aria and Collins are two of my fav girls names. You look great! As for a name, how about Elena? You look great! I LOVE the name Seraphina. You look gorgeous in this casual spring look!! I had the same issue choosing my daughter’s name! I picked her name just two weeks before she was born. I named her Sophia. I named my son Jackson. They are both the top names now for boy and girl in 2014! I guess I was ahead of the trend;) I just love the name Madeline. I have a Sister Missionary who has touched my heart with her faith and that is her name. I also really love the name Harper. Good luck choosing a name! You’ll just know when you pick the right one. Love the hat and shoes! Beautiful! That hat is gorg!! I love the name Madison, but picking one out must be so hard! Best of luck with it!! These shoes are amazing! Can you get any cuter pregnant!? Perfect outfit and I just might need to order myself that hat! I love the name Cora. Cute casual look! Your baby bump is the cutest. So happy for you dearest! Hope you and Drew like them! You’re an inspiration! Gorgeously rocking your pregnancy. Some favorite girl names of mine are: Eden, Stella, Adeline, Ellison, Elodie, Reese, Emory, Wren, Willa, Delia, Ivy, and Leona! I love this! So stylish yet it looks comfortable at the same time! Which is perfect with that adorable tummy I imagine! :) Your shoes are absolutely adorable! As a middle name, Rose is beautiful with nearly any first name and equally nice with Parcell. All beautiful… Good luck, you look amazing! My daughter’s name is Kolbe… I may be biased but I love that name for a girl! Looks like you have lots of suggestions from which to choose from your readers! I love classic feminine names like Lauren, Catherine, Caroline, Claire and Kate. Having had a child go through elementary school, however, I would say (for the sake of your daughter) to avoid anything too trendy or “unique” — especially “unique” spellings of names. It’s confusing for everyone, and the child will constantly have to spell her name for people, AND deal with people mispronouncing and misspelling her name even into adulthood. I have one son and went with something “somewhat” traditional, but having been a “Room Mom” for the last five years, I heard so many strange and whacky twists on names it almost made my head spin. Enjoy your last month of pregnancy! Beautiful as always! Love your shoes! Rachel, I love your blog and everything you do!! You are extremely talented and seem like such a sweet and wonderful girl!! I am sure your little princess will have an unusual and beautiful name. I LOVE the name “Ever”. You don’t hear it often at all which I think is great. For a baby girl name recommendation, I would say Akala, which is the Hawaiian word for pink. I think it goes well with your love of Hawaii, all things pink and is similar to your maiden name! You are simply glowing, Rach! What a beauty! We have two girls- Scarlett Emerson and Clara Grace. So I’m partial to those names. Ainsley Elizabeth would have been our 3rd girl, but we ended up with a boy. Good luck choosing a name! I’m sure you’ll pick a beautiful one! Congrats to you & your hubby! I suggest Iris. It is such a lovely name & flower. Love this simple casual look! Those flats are adorable. I like your hat, it goes perfectly with that bag. Naming our son was so tough. Little girl names seemed to be easier! Here are a couple ideas. Best of luck, these sweet baby souls are the greatest gift! Very cute casual look! I’m obsessed with those shoes, they are on my wish list. Good luck with the name game! I can imagine that’s super hard. I have never commented before but I love your blog and had to comment on the name thing :) I will be honest I didn’t read all 133 comments so i apologize if this has been said already but I LOVE the name Charlie for a girl. You can name her Charlotte Parcell but call her ‘Charlie’. I have a sweet little boy named Charlie and even if he was a girl we would’ve used that name. Just a thought :) Good luck! You look so chic and stylish. I adore this combo and you did a fantastic job styling. I especially love your hat! You look amazing and are quite the inspiration to pregnant women! It’s an amazing time of life, enjoy every minute. i love love love that bag!! As for the name, I love Finley, Emerson, and Charlsie. My daughter’s name is Charlotte Rose. Love your look! Love your style! I think Nicolette is a cute name with nickname Nikki, of course! We just had our first baby girl in December and we named her Emerson Ann, and she usually goes by Emmie! It’s an old name but also unique! Good luck! I love the name Romy! Love the name Mia Grace or Savannah and Amelia. Good Luck! I love the name Elle Marie…. Wanted to name my son that when we thought he was going to be a girl Xoxox you look gorgeous btw! Blair. It sounds like the name of a confident, beautiful girl who has a good head on her shoulders. I love the Rockstuds with this weekend look & pink hat! I have a heeled pair and they are my favorite shoes! I love Carlin, Malia (ma-lee-ah), Layla, or Shay. Love your Valentinos. Are they comfortable? You have so many new names to decide upon based on all these comments! Lots of great suggestions here. I was the opposite with naming our daughter, we had talked about it well before ever getting pregnant and already had 2 girls names and a boy’s name picked out but I was certain I was having a girl so even before we had the ultrasound, we referred to her while she was in my belly by her name (just to one another) we didn’t announce it until she was born. I’ve always loved the name Lily, both my husband and I are Christian and he traveled the globe doing mission work before we married as an Evangelist for God so it seemed fitting that her middle name be Evangeline. Names with meaning are always nice. We decided absolutely no family names, we wanted her to be her own person without being a jr., etc. I adore flower names, they are so timeless and elegant. Because your last name starts with “P” you could totally get away with having her middle name be Peony. Other names I love that we considered: Elle, Ella, Isabella, and another that I’m keeping secret as it would be our next daughter’s name if we have another. Other beautiful names: Chloe, Savannah (what my BFF named her little girl and her nickname is Savy), I also like Georgia, Everly, Charlotte, Arabella (Ivanka Trump’s daughter’s name) ;) Can’t wait to hear the name you choose. It’s such a big decision but something tells me whatever you choose will be lovely. We have three girls and wanted unique but not strange. They are Laurel, Chloe (which NO ONE used at the time) and Helena. Good thing our husbands are good with pink! :) I have two March/April baby girls! Best of luck to you! PS – Take a few to the hospital with you and say them as you look at your precious gift. One will fit and you’ll both know. Worked for us. What about my name, Nicola? Very unusual in the USA where Nicole is preferred! Other favourites include Rae, Alba, Rosa, Hannah, Ingrid and Alexandra. Good luck choosing! First of all, you look absolutely stunning!! I love this look and how your pretty accessories add the perfect extra touches. Whatever you pick will be gorgeous and I can’t wait to see your baby girl! My little girl are named Chandler and Carys. I adore these names. I am such a sucker for alliteration…I think Piper or Pearl would be so cute with your last name! I need those shoes in my collection! I just am loving pastels lately! I love the name Harper or Emory! Good luck! Can’t wait to find out! 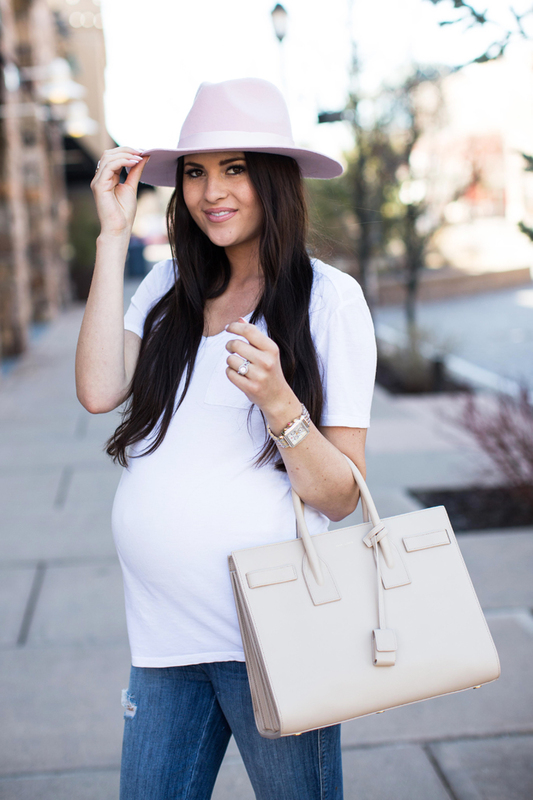 This blush hat is so pretty on you! I am currently pregnant as well and can not button my jeans– does the belly band hold up your jeans since they are unbutton and will slide down? Love this look! My favorite names are Violet, Charlotte, Eloise and Naomi. Wish you and your growing family all the best! That is so exciting! How about Chloe? I love my name Annica or Annika I go by annie for short. I also like th names: Amara, Eva, Arianna, Adeline! My 5-year-old’s name is Jovie. I have yet to encounter another person with that name, which is another reason I chose it and still love it. Good luck! How about : Sadie or Micha. I absolutely just LOVE this look! Simple, yet chic. I like Aila, Emmaline, Charlotte (Charlie for short), Harper, Alice, and Ella! Hi from Auckland, New Zealand! Apparently no one calls their babies Jody anymore so how about bringing it back into vogue? I know it’s the boy’s spelling of the name but back in ’71 when I was born, my parents were quite radical to not spell my name Jodi or Jodie! So many great name suggestions in theses comments! But I wanted to ask about your jeans. I know you have them rstyled linked & labeled as Current Elliott, but the double x embroidery is the Genetic Denim logo… Are they the Genetic Denim ‘The Shya Cigarrette’ in Destroy? I think choosing a name is so complicated and it is so important. Her whole life will circle around this name. If chose right it will guide her, if chose wrong it will hurt her. My parents choice was Marie-Emilie, I am french canadian but I think this name is original and people always say beautiful things about it. If I ever have a girl, I want to name her Lili Rose, I think it is the most beautiful name in the world. Choose a right name that will make her shine all the time. hello rachel! I’m so happy for you and drew and your exciting future! The pictures of the nursery are absolutely adorable. I only hope that one day I can decorate my babies room as cute as yours! As for names go, I have always loved the name Kelsey, as well as drew or Cailee! I’m sure you both are way more creative than I am when it comes to baby names, as I have plenty of time to think about that since I am still in school! Hope all is well with you and your family! How about BAILEY for your daughter? Bailey Parcell. My oldest daughter is named Bailey and she will be 23 years old. At first people thought it was odd, but I loved it from before she was even born. I also have a 19 year old daughter named Bradley Rachel S. We were told she was a boy at the last ultrasound and never chose a girl name, idiots! When your full of drugs after delivery what do you do? Keep the name you fell in love with! She was the ONLY female brad for a long time and now its kind of popular. College applications were hectic because everyone thought she was a guy LOL! But it suits her just fine. You look beautiful and happy. Good luck and try to rest as much as possible. I pray for a safe delivery and recovery. Ericka Theresa is a pretty first & middle name pair. That spelling of Ericka is unique and different too! I’m sure the name you pick will be beautiful as I’m sure your little girl will be too. Oh I Love this !! Love this look and love the name Marlowe for your little girl!